Wouldn’t it be great to have an effective lice treatment that didn’t require marathon housecleaning, obsessive nit-combing, or dousing in toxic pesticides? A new treatment developed by Menlo Park dermatologist Dale Lawrence Pearlman may be a dream come true for parents, teachers, and kids. Nuvo, the new non-toxic lotion, is applied wet and then blown dry with a hair dryer to create a ‘shrink wrap’ film over the hair. The idea is to plug the breathing holes of the lice, suffocating them. The film is then washed out 8 hours later with the child’s regular shampoo. This kills the lice, but not their eggs, so the procedure is repeated once a week for a total of three easy applications. How well does Nuvo work? 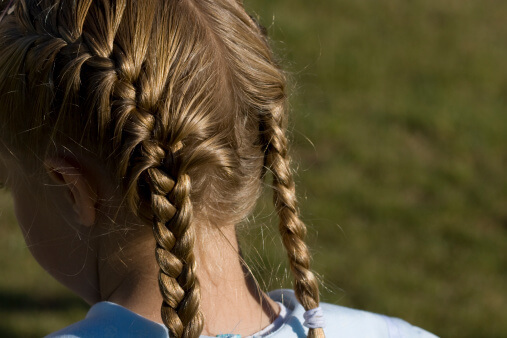 A simple, preliminary study appeared in the September 2004 electronic edition of Pediatrics, analyzing the results of 133 children with difficult cases of head lice. Happily, 96 percent of the children were completely cured, with no nit-combing, housecleaning, or neurotoxins. None of the children or parents reported irritation, discomfort, embarrassment, or other side effects. I see three other potential benefits of the new treatment. Not only does it avoid neurotoxins on the child, it avoids neurotoxins going down the shower drain and getting into our water. Secondly, lice can’t become resistant to suffocation, as they can to pesticides, so stronger and stronger medicines won’t be required. Thirdly, parents could use Nuvo to tell easily and safely if a child has lice. When the lotion is put on, combed out, and put on a special pad, you can see they if they are there. Nuvo is not yet commercially available, but I hope someone manufactures it. In the meantime, many people have reported success by suffocating lice with mayonnaise, petroleum jelly, olive oil, or essential oils — but no clinical studies have yet verified their value.